Membership in the UCT is useful for researchers from all kinds of research institution who want to digitally support team work in research projects. Lecturers from the fields of computer science, business informatics, economics or similar disciplines can also use the “Computer Supported Cooperative Work (CSCW)“ course material in their own lectures. The course has been designed and continuously developed by the UCT team and is available free to all lecturers. The CSCW course is already offered in several member institutions. It consists of a total of 10 individual lessons of 90 minutes and is designed for a total of 6 ECTS points. The taught content examines theory or CSCW and the tools and effects of computer supported team work as well as methods for their implementation. The group work is studied from a technical, organizational and also sociological point of view. The related exercise “Enterprise 2.0 – The Game” provides practical skills for the use of selected Social Business Software. The participants work in groups for one semester on directed assignments and practically evaluate several collaboration tools. The exercise „The Game“ consists of five work packages with work instructions. Based on a fictitious case study company, teams of students compete against each other as groups of consultants to advise the company. Students examine the functions of collaboration systems in an explorative way and connect the concepts taught in the lecture with the practical use of Social Business Software. The conclusion of the exercise is a presentation by each student team of their technology and business solution for the case study company. From the practical experience that the students gain from the business simulation, they learn to identify the requirements of businesses for collaborative technologies and to develop practical solutions. Both the lecture and exercise are based on the 8C model for Enterprise Information Management, which was developed by Prof. Dr. Susan Williams as a framework for the analysis and evaluation of specific collaborative technologies as an integral part of the information infrastructure of a company. It provides a useful analytical tool for projects to introduce or expand Enterprise Collaboration Systems and sets a specific technology project in the context of the company’s entire business. The model includes a total of eight elements, which are grouped into two areas. 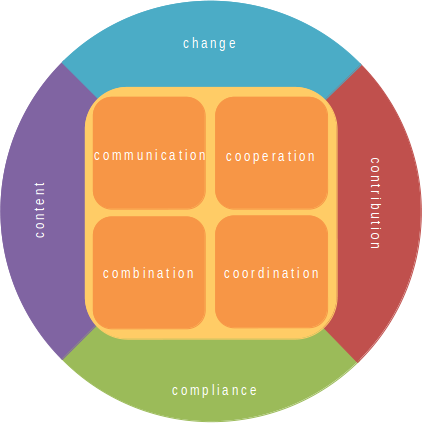 The core (Communication, Cooperation, Combination, Coordination) contains functional elements. The outer ring (Content Management, Compliance, Change, Contribution) represents key aspects of management of the used technologies.